Banquettes have a nostalgic charm about them, whether you sat at one in your grandmother’s kitchen or you shared a diner booth with friends in college. But is this distinctive seating right for your home? For insight, we reached out to kitchen and bath designer Susan Klimala, CKD – CBD and owner of The Kitchen Studio in Glen Ellyn, IL. “Banquettes allow for a cozy, intimate dining experience with a casual feel, but they’re not for everyone,” says Susan, who has designed numerous banquettes, including one in her own kitchen. 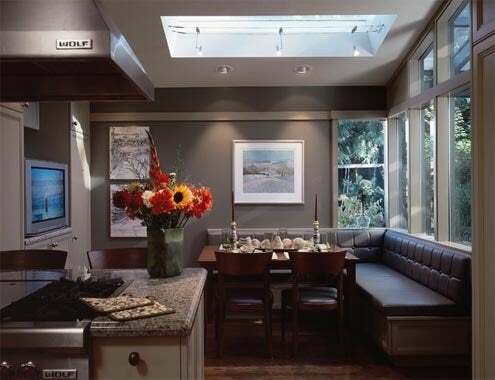 She cites several good reasons to consider a kitchen banquette. 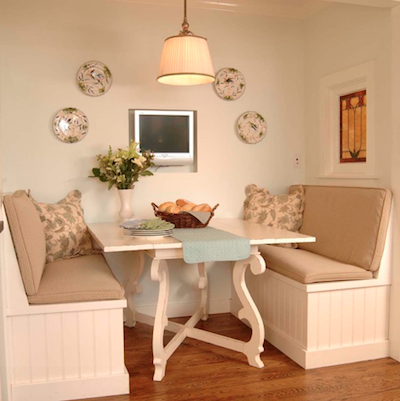 If you are thinking about putting a banquette in your kitchen, heed Susan’s advice: Ideally, you need a minimum of 27 inches of space for each person to sit comfortably. The depth of the benches should be at least 24 inches, because you will want to leave space for an angled back or upholstered seating. The table should overlap each bench by three inches or so. If you are designing a banquette in front of windows, be sure that the windows are a good 24 inches off the floor to allow for a seat height of 15 inches (not counting the height of the cushions). When it comes to upholstery, opt for something washable. Fabric-upholstered cushions are never a great idea, especially with children. Choose an upholstered banquette in leather or pleather, just like the seating you would find in a restaurant. Such material can be easily wiped clean, and you won’t have to deal with the cushions falling off the benches. Your local upholsterer should be able to help you pull this together.